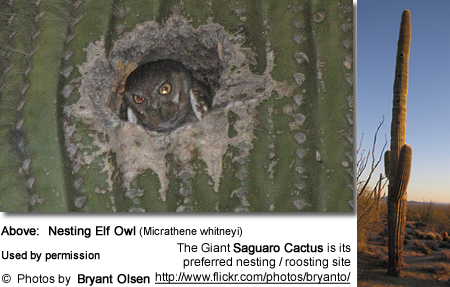 The Elf Owls (Micrathene whitneyi) are nocturnal birds with bat-like flight that occur naturally in southwestern and south-central United States and Mexico. Some populations are migratory, others sedentary. At an average length of 6 inches (15.24 cm) - about the size of large sparrow - the Elf Owl is the smallest owl in North America and the world's second smallest (the first being the Pygmy Owl). At a weight of about 1.4 oz (40 grams), this is the world's lightest owl. 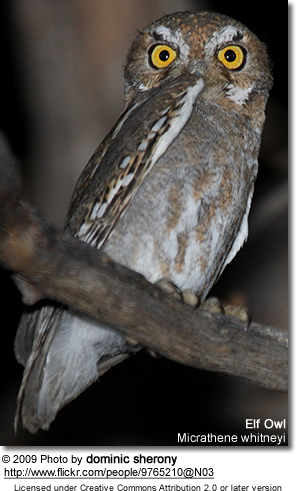 As is typical of owls, Elf Owls are nocturnal - with most of their activities occurring at dusk and before dawn. Pairs are often observed playing with each other by jumping from tree to tree emitting their well-known high-pitched, whinny calls. They move around by walking and hopping on the ground or by climbing, like parrots. They fly in U-shaped arcs between perches, or glide and hover. Baja California, northwestern Mexico (states Sonora and Sinaloa), Central Mexico and Socorro Island (off the western coast of Mexico). Some winter as far south as Central America. Most of those occurring in the northern parts of their range (along the United States-Mexico border) winter in central to southern Mexico and Central America. The southward migration is believed to be prompted by the lack of nocturnal insects due to the cold winter nights in their breeding range. Populations found in Texas are reported to be at least partially resident. Those breeding in Arizona, typically arrive in March and leave in September. Non-migratory populations exist in the state of Puebla located in East-Central Mexico and in southern Baja California. Elf Owls occur in ravines, canyons, plateaus (tablelands), and on mountain slopes from 2,000 to 7,200 feet (600 to 2,200 meters) elevation. Some have adapted to partially urbanized areas. They inhabit arid upland deserts with various cacti (particularly favoring areas with a high occurrence of giant saguaro cacti), thorn scrub, dense mesquite, dry oak or riparian woodlands (however avoiding pure stands of pine). Migratory populations. They breed in southwestern USA (extreme southern Nevada, southeastern California, across to central Arizona, southwestern New Mexico and southwestern Texas). They migrate south to winter in northwestern Mexico (Sonora). Resident populations. They occur naturally in the southern tip of Texas south to central Mexico (Puebla and Guanajuato). Found in southern end of Baja California and parts of Mexican mainland. Range: Occurred only on the island Socorro, south-west from the tip of Baja California. This race is believed to have become extinct around 1970. The tiny Elf Owls measure from 4.88 to 5.9 inches (12.4 to 15 cm) in length (from head to tip of the tail). They weigh from 1.23 to 1.94 ounces (35 to 55 grams). Males and females look identical, except females are typically about 3% longer than males and about 6% heavier. Their wingspan is from 13.5 - 16.5 inches (34 - 42 cm); and the long wings extend to the base of the tail feathers when perched. The short tail measures from 1.8 - 21 inches (4.6 - 53 cm). They have fairly long legs that allow them to chase their prey. They often appear bow-legged. The feet and claws are tan to dull yellow in color and sparsely covered with feathers. The bill is greyish with a horn-colored tip. The round head lacks the ear tufts that are typically seen in other owls. The plumage ranges in color from light grey to brown, with grey spots on the forehead and two rows of whitish spots on the wings. The facial disc is reddish brown / cinnamon with V-shaped, whitish "eyebrows". The back is greyish brown with buff mottling, with a broken white collar running along the lower nape (back of the neck). There are cinnamon-brown vertical stripes on the otherwise buff-colored chest. The abdomen is a lighter grey to white. The tail is barred with 3 to 5 horizontal pale stripes. The eyes are pale yellow colored. The immature bird has a deep brown head and face and lacks the orangey-brown or rust color seen in adults. 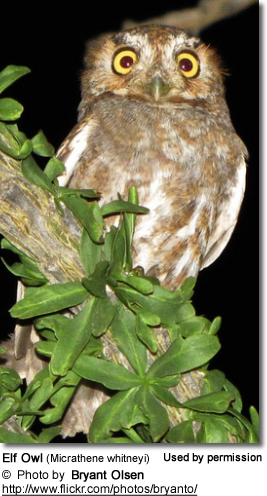 Identification is most easily done by the uniform brown-grey crown that lacks the spots seen in the adults. The face is greyer than the adult's - without the ruddy flecks. The upper plumage is similar to that of the adult. The plumage below is whitish with a light wash of buffy-brown and narrowly barred with a darker brown. Readily distinguished from other owls by its smaller size. 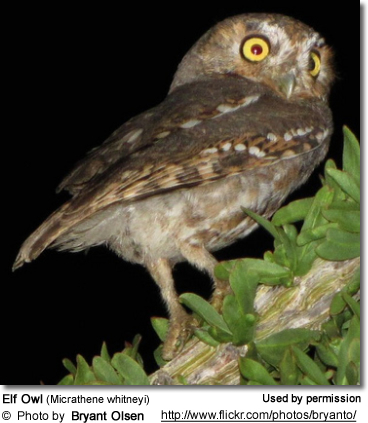 Could be confused with the Pygmy Owls; however, those Pygmy Owl species occurring within their range are mostly diurnal (active during the day) separating them from the nocturnal Elf Owls. 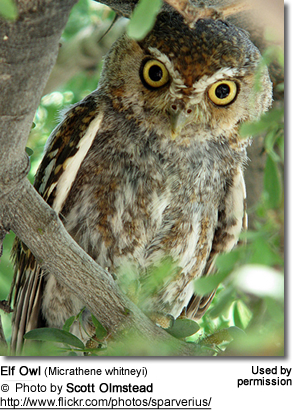 The similar Flammulated Owl can be identified by their brown or black eyes (irises). Mostly active at night. Perch fairly erect, with a knock-kneed stance. They are generally non-aggressive, preferring to hide or fly away rather than face a predator. They typically hide themselves by covering the pale underparts with one wing. If confronted or captured, they have been observed to "play dead" until the danger has passed. Elf Owls reach reproductive maturity when they are about one year old. They are mostly monogamous, remaining with the same mate for life. However, some are serially monogamous, remaining together for the length of a breeding season and pairing up with another mate for the next season. They usually only nest once a year; however, they may produce a second clutch if the first one has been destroyed and they may replace lost broods. Nesting usually starts in April or May and usually lasts until about July. The breeding density is about 11 pairs per square mile (4.6 pairs per square kilometer). Breeding pairs usually remain within 65 - 230 feet (20 - 70 meters) from their nests. Males will attract potential mates to nest sites by calling from the nest cavity, then flying out and singing to approaching females. Males typically defend several nest cavities, and females often choose mates based on the quality of the nest cavities. The typical nesting sites are north-facing woodpecker cavities in Saguaro cacti, sycamores, cottonwoods and other hardwood trees, typically found about 10 - 33 feet (3 to 10 meters) above the ground. Once the female has decided on a nest site, she roosts in the cavity for a while before actual nesting begins to prevent the nest cavity from being taken over by other cavity nesters. A clutch consists of about 1 - 5 white eggs, the average being 3. In desert areas, the clutches tend to be larger than in other habitats, probably due to warmer temperatures and more abundant food supplies. The eggs are laid at intervals of 1 to 3 days, with incubation usually starting after the second egg has been laid. The eggs are incubated for up to 24 days to hatching. Most of the incubation is carried out by the female; however, the male will take over when the female hunts at night. Hatchlings are covered with thick white down and have large feet and bare heel pads. Their eyes open when they are about 5 - 6 days old; and at 9 - 12 days, they can sit up and snap their beaks. Initially, the young are mostly fed by the female who passes to them food that the male brought to her. The male hunts and takes prey to the nest throughout the day, as often as once per minute. Once the chicks are about 2 - 3 weeks, the female will also collect food. The young generally start practicing flight (initially unsuccessfully so) at 21 - 22 days. Fledging occurs about 28 - 33 days after hatching. By the time, the young fledge, they are adult size. When they are about 4 months old, they resemble the adults. Elf Owls feed mainly on insects (moths, spiders, grasshoppers, beetles, locusts, mantids, fly larvae, cicadas and centipedes), and occasional small rodents, birds, lizards and even small snakes. They are also known to eat scorpions, removing the stingers of scorpions before eating them. Prey is usually captured in flight or plucked from tree branches or from the ground. Larger prey is usually carried to a nearby perch, where it is torn apart before being eaten. Any surplus food may be "stored" to be eaten at a later time. They don't appear to be drinking water and are likely to meet most (or all) of their moisture requirement through their diet. Their calls can be heard throughout moonlit nights, but are most intense just after dusk or at sunset. The male's primary advertising and courtship calls are described as high-pitched yip, "whi-whi-whi-whi-whi" - repeated up to 20 times - with the courtship call being shorter than the advertising call. Pairs are often observed darting around trees and calling back and forth. They perform duets together, with the female's song being softer and shorter. The female's short "peeu" helps her mate locate her. When disturbed, both parents will emit sharp "cheeur" sounds - often repeated several times; or they may produce bark sounds as they face or mob predators. 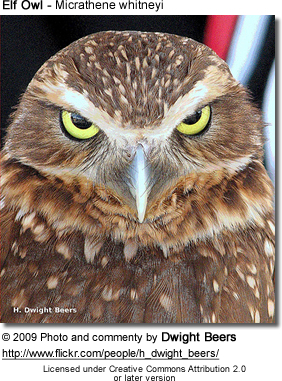 Elf owls also clap their bills during threatening situations. During the nesting period, parents only make short, single, soft whistle sounds to communicate, to minimize the risk of attracting attention to the nest and any young. The nestlings' calls are described as repetitive rasping or twitter sounds, which can be heard when they are calling their parents to be fed. They may also peep or squeak softly. The volume of their calls will increase with their level of hunger. During feeding, they emit high-pitched trilling sounds. Captive birds have lived up to 14 years. However, those in the wild only live up to 5 years, due to predation by other animals, exposure and competition for food and nesting sites with other species. The highest mortality is amongst the eggs and hatchlings, as they are targeted by other birds and reptiles, such as snakes. One to four pairs of Elf Owls will often cooperate by mopping potentially threats with physical assaults on their heads. Individuals may camouflage themselves by covering their lighter underparts with their wings or they may "play dead" when confronted by a predator. Elf owls are protected under the United States' Migratory Bird Treaty Act and they are listed under Appendix II by CITES.